The choice of serious chess players, the Chronos line of digital chess clocks is renowned for its unmatched durability and reliability. Manufactured in the United States, each clock is housed in a strong metal case and will withstand years of use. But don’t let the rugged exterior fool you – the Chronos Digital Chess Clock has all of the features and time controls that you could ever want. 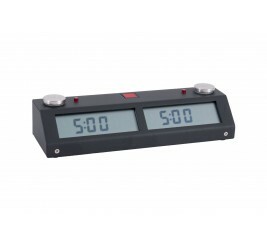 It has over 70 pre-programmed time controls and the ability to store up to 12-user-defined time controls. Required three AA batteries (included). The choice of serious chess players, the Chronos line of digital chess clocks are renowned for their unmatched durability and reliability. 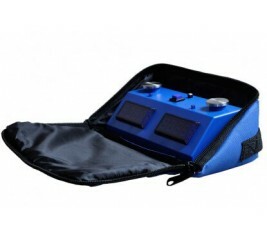 Manufactured in the United States, each close is housed in a strong metal case and will withstand years of use. The Chronos GX is the newest addition to the Chronos family and features 4 preset blitz times, 8 preset tournament controls and supports both delay and increment modes, making it ideal for tournament players. Requires three AA batteries, which are included. Made in the USA, the Zmart Pro Digital Chess Clock was designed from the ground up to offer what all chess players both demand and need. It is very easy to use - you can learn all of the features of the clock within a few minutes. It is great for anyone - fun for kids, classes, and clubs. With a sturdy metal case, low profile design, extremely large display and touch-sensor technology, it’s one of the finest chess clocks ever produced. The New Clear Clocks Are Now Available! Invest in a quality chess clock with a variety of styles and brands to choose from at The House of Staunton. Some chess clock brands offered include: Chronos, Saitek, and Excalibur. There are also a variety of styles of clocks to choose from including digital clocks, analog clocks, and mechanical clocks. 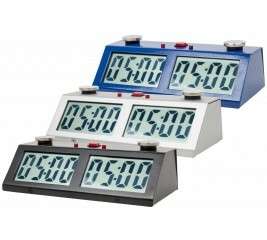 There are clocks for both the serious chess player and the casual chess enthusiast. These clocks are easy to use and easy to set up. 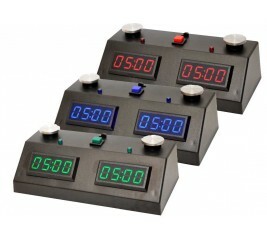 Chess clocks serve as timers for chess players, they record the players accumulated times, and have buttons for stopping and starting the time at the end of each move. 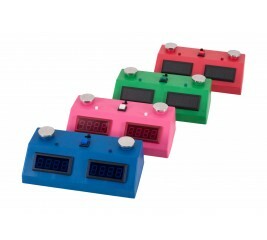 The easy timer digital clocks are ideal for chess beginners and chess players that are budget conscious and do not need the advanced features offered on the more expensive models. 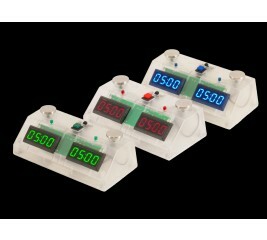 The digital folding clock has all the features a chess player needs in a clock for tournament or blitz chess. Some mechanical clocks do not require batteries, just winding. These mechanical clocks are housed in a beautiful solid wood case, and have quiet mechanisms. 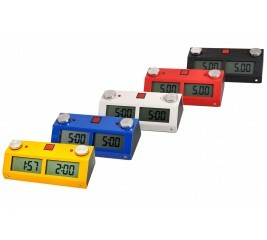 You won't find a more attractive chess clock for these prices anywhere.